As indicated in the Challenges for Teachers section, there is little research-based guidance on how to help students read mathematics texts. Strategies adapted from general literacy practices or literacy practices for other content areas may or may not be helpful in reading mathematics texts. Sheldon and Shepherd (2013) found that there is a lot of advice, much it from authors of textbooks but that, "while the ... suggestions appear reasonable and are probably based on the textbook authors’ own experiences while learning mathematics, it is far from clear that they are effective. We do not know of any research on this” (p. 3). Given the lack of empirical research, the suggestions in this section are ones that seem to provide some promise of effectiveness but are still largely untested. There are few things more frustrating for a student that being told "this is easy" when, in fact, it is not at all easy for the student. Teachers, when working with students learning to read their high school mathematics textbooks, need to recognize that for students just learning algebra concepts an Algebra 1 textbook may be just as challenging as an undergraduate textbook might be for the teacher. Think back to the Textbook Reading Activity that you did earlier. You identified a number of characteristics of mathematical texts that make them uniquely challenging to read. These challenges are as present in high school texts as in college texts. Acknowledging these challenges may go a long way toward making students more willing to engage with the texts and avoiding the frustration that students face when they have difficulties doing something that is presumed to be easy. Acknowledging the challenges inherent in reading mathematical texts may also help students to recognize that they will need to approach these texts differently than they might a novel, a news article, or even a social studies text. Students may find it useful to know that, in reading a mathematical text, they may need to read "from right to left, top to bottom, bottom to top, or diagonally" (Sheldon, Seldon, & Seldon, 2011, p. 4). Similarly, knowing that they need to be on the lookout for three different types of vocabulary: Mathematical English, Ordinary English, and Words with Dual Meanings, may help students approach mathematical texts differently. Knowledge of the different types of challenges inherent in mathematical texts is likely to help students develop some of their own strategies for engaging more productively with them. Coordinating multiple representations of the same mathematical object is a major part of what it means to engage in doing mathematics. In mathematical problem solving we are generally working to use one representation of a problem situation or mathematical object to inform another representation. For example, when solving a problem about rate of change, we might work with a graphical representation and a symbolic representation to better understand the problem and to arrive at a reasonable solution. If we extend our ideas about representation and consider the verbal representation of written text as an alternative representation of a mathematical object, then reading a mathematics textbook becomes another opportunity to coordinate multiple representations. To illustrate, let's return the undergraduate text that we looked at earlier. 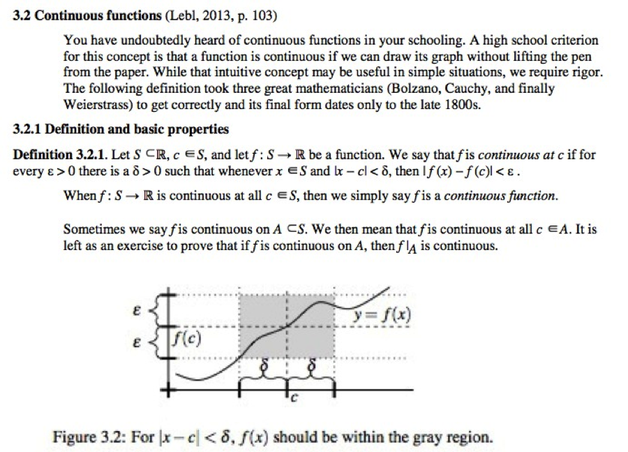 In the first paragraph we have a verbal representation of a continuous function. Next we have the definition which is, essentially, a symbolic representation of a continuous function. Finally, we have a visual representation of the same mathematical object. A basic mathematical process would be to work to coordinate these 3 representations. We ask ourselves how the picture illustrates the verbal representation and how the symbolic representation is demonstrated in both the picture and the verbal description. Notice, that, in treating the text this way, we have moved from trying to read the text in a linear fashion to working back and forth between the related sections. An advantage of this strategy for students is that it moves them away from the notion that mathematics text are meant to be read simply left to right and top to bottom in a linear fashion. In addition, for students who are accustomed to coordinating representations, it provides an already familiar process for engaging with mathematical texts. Borasi, Siegel, Fonzi, & Smith (1998) report some success in using transactional reading strategies to help students engage with mathematics-related texts. In their work, they had students stop at intervals as they read the texts to discuss with partners or a small group. They used several strategies to foster this type of interaction. One strategy was to have students "say something," sharing a thought or questions about the text or putting the ideas in their own words or making connections between the text and the students' own backgrounds. Another strategy involved having students stop and list the major ideas of the text then arrange the ideas to show the relationships between the ideas. A third strategy involved having students stop and sketch their understanding of what had occurred in the text. All of these strategies are designed to help students interact with the text in a holistic manner rather than seeking out small, poorly connected pieces of information. Borasi, Siegel, Fonzi, & Smith believe that, " students need to interact with text to make meaning rather than 'mining' them for information" (p. 275). It is important to note that, although these researchers report some success with these strategies, the students involved in the study were not reading mathematics texts but, rather, articles, essays, and stories about mathematics. Whether these same strategies are helpful for reading technical mathematical texts has not been examined but the strategies seem likely to help address the unique nature of mathematical texts. Culminating Activity: Apply the ideas in this module to a mathematics text. Use the lists of challenges that you identified in the Textbook Reading Activity to identify at least 3 major challenges that students will face in reading this passage of text. As you do this remember that your students are not as knowledgeable about the mathematical content as you are; pay attention to format, syntax, and vocabulary issues, not to the underlying mathematics. Identify the different representations used within the text to represent the same mathematical object. Examine how each of these representations obscures or makes more evident different features of the mathematical object. Consider what you might use for stopping points if you wished to try transactional reading strategies with students using this text. At each stopping point list the ideas that you hope students might notice, the connections that you hope students might make to prior mathematical knowledge, and what types of sketches your students might produce to illustrate the concept. Have your students read the selected text and use some of the strategies here to help students better understand the text. What seems to be effective? What does not?